Engravings of people and animals can be seen on boulders in numerous locations throughout Faynan, often found at places that provide spectacular views or on key communication routes into the escarpment. Most of the motifs were made by a technique known as pecking, which involved hammering into the rock face to create images of people, ibex, camels and signs; in some cases, people are shown riding animals. 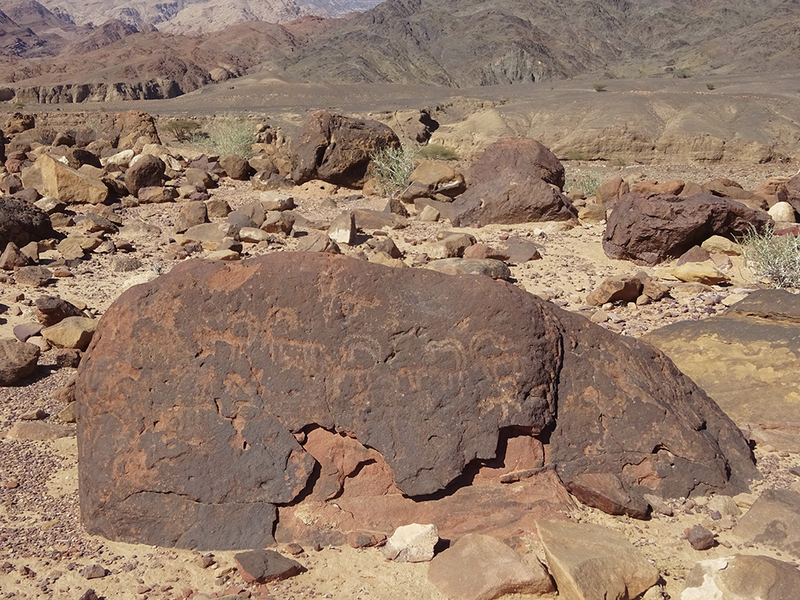 On several boulders the engravings have been superimposed above one another, with the earliest appearing to be images of ibex or wild goat. While dating rock engravings is extremely difficult, it is likely that many of these date to the Bronze Age, especially those which have images of people riding donkeys, horses and camels. These could, however, be more recent in date, while some of the less well-preserved images might be Neolithic or earlier. There are two notable clusters of pictographs in Faynan. 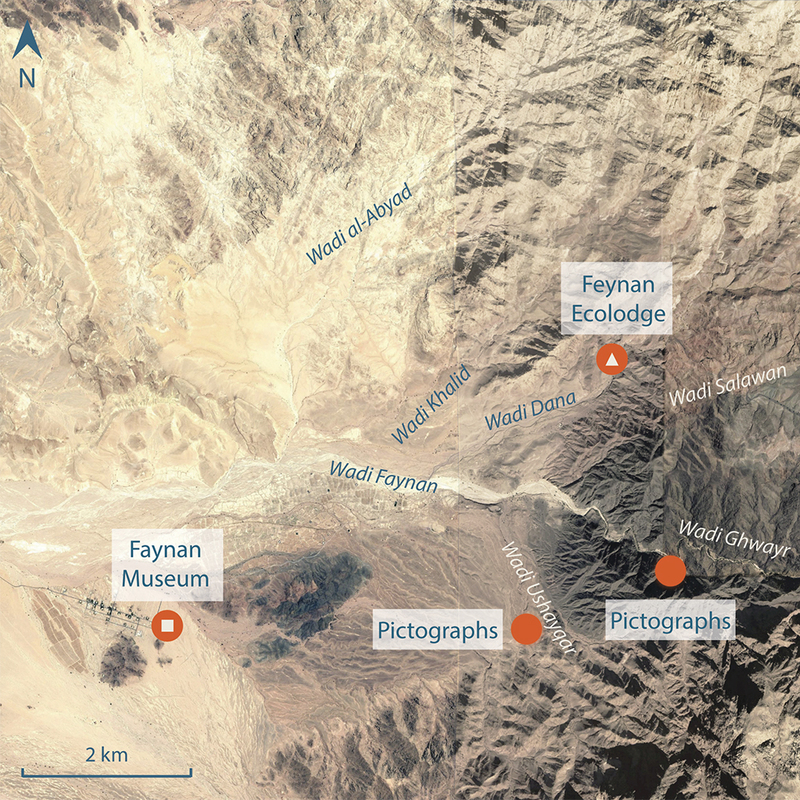 The first site is located around the upper reaches of Wadi Ushayqar, towards where it meets the edge of the escarpment. 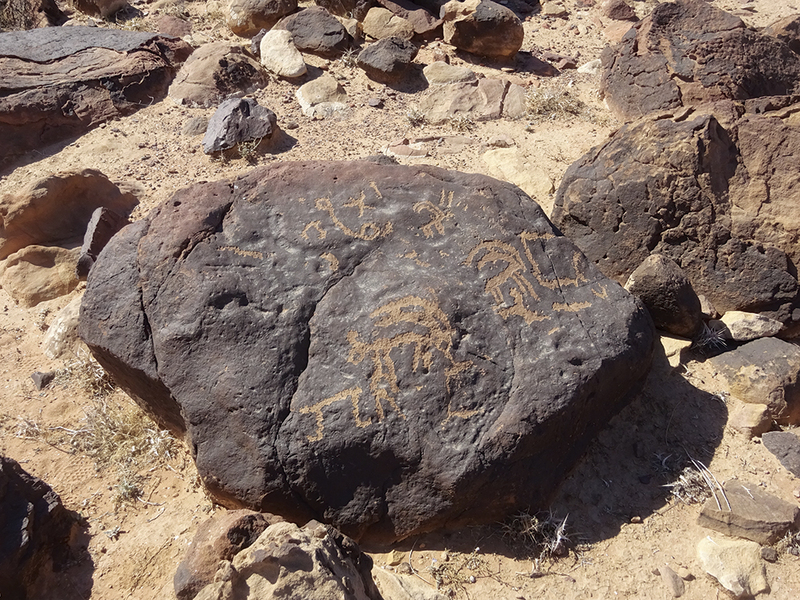 Here one finds numerous decorated boulders, some with a single motif of an ibex and others with complex depictions, with one appearing to represent an ibex hunt on horseback and using dogs. A second cluster is found on a small terrace within Wadi Ghwayr. These show a wide range of weathering, some being only faintly discerned suggesting they might date back to the Neolithic.